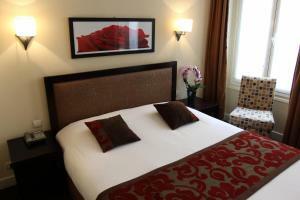 Located in central Paris, between the Arc de Triomphe and the Palais des Congrès, 950 metres from Champs Elysées, Etoile Saint Ferdinand offers classic air-conditioned rooms. 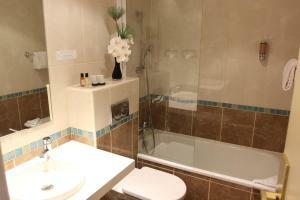 Each room is equipped with free WiFi access, TV, double-glazed windows and a private bathroom. Some rooms have tea and coffee making facilities. Metro Porte Maillot is 300 metres from the hotel, which can take guests to La Défense and gives guests access to all of Paris' famous sites. Please note that only 1 baby cot can be accommodated per room. A Pocket WiFi is available for € 10 per day to enable guests to have WiFi access outside of the hotel, throughout city. It can be used on up to 10 devices. Rate: € 120.60 ... € 309.00; select dates below to get current rates. 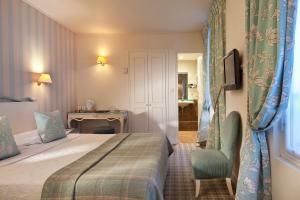 This twin/double room has air conditioning and soundproofing. 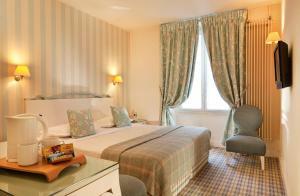 This room can accommodate an extra bed upon availability and prior request and at an extra cost of EUR 30. These 2 adjacent double rooms have a soundproofing and air conditioning.